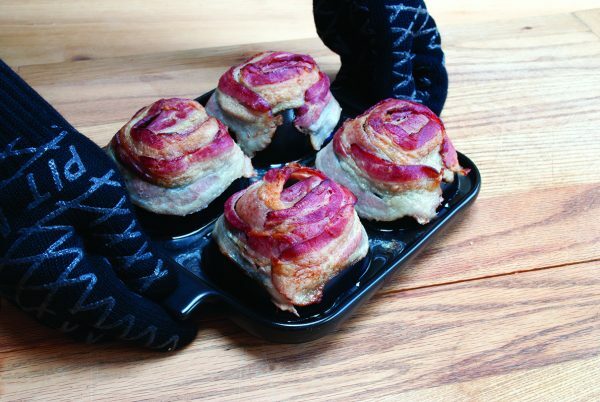 You are here: Home › Blog › Recipes › Making Bacon Bowls: Delicious and Easy! Now more popular than ever, bacon has become much more than just a breakfast food. Bacon’s one-of-a-kind flavor can be found in almost anything, from potato chips to pizza to bacon dipped chocolate the tasty treat seems to have found a place in nearly every food category. These cured slices of pork belly have the perfect balance of flavor and texture, making them the perfect ingredient or side dish for just about any meal. If you love bacon as much as I do, there’s an awesome new bacon dish you’ve got to try: the bacon bowl. Your eyes aren’t deceiving you, we’re actually talking about a bowl made entirely out of bacon! 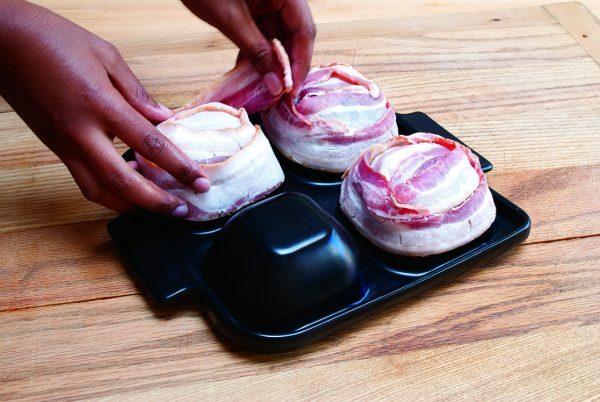 If you read our previous blog about the Flame Friendly Bacon Bowl Rack then you’re no stranger to the concept, but if you didn’t then buckle up because you’re about to experience bacon on a whole other level. Place the rack on a clean work surface with the ceramic bowls facing up. Starting at the top of bowl, begin wrapping the bacon around it, slightly overlapping each piece until the bowl is covered completely. This should take 3-4 slices of thin-sliced bacon. Once the bowls are wrapped, place the rack on your preheated grill over indirect flame. Cook the bacon 30-45 minutes until almost fully rendered. Using heat safe gloves, carefully remove the rack from the grill and drain the bacon fat using the built in pour spout. Allow the rack to cool 5-6 minutes. Gently loosen the bacon bowls from the cups and set them on a clean plate. 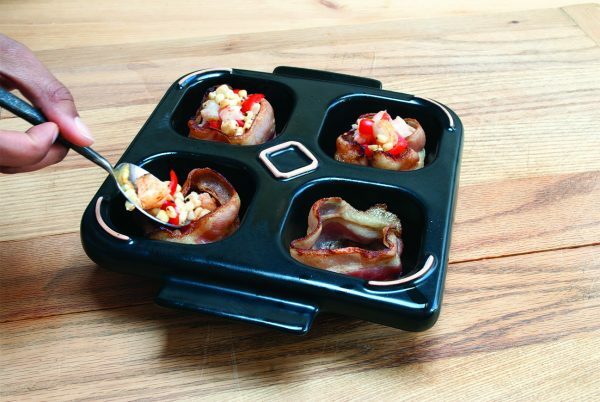 Invert the rack and place the bacon bowls inside. 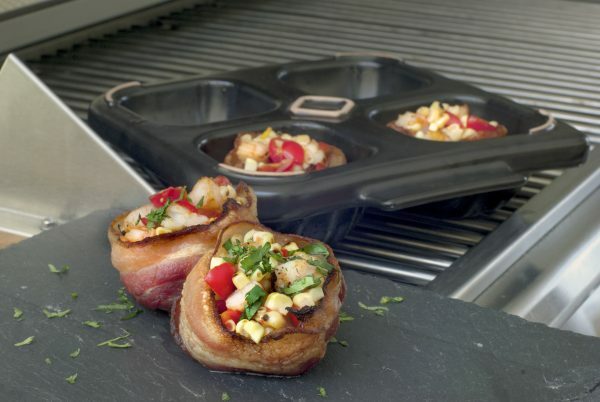 Add your choice of fillings and continue grilling bacon bowls until fully cooked. Follow 3-step cooking method mentioned above. Grill corn until well charred on both sides, then use a knife to remove the kernels. Slice grape tomatoes into quarters. Grill shrimp over direct flame until nearly fully cooked, then chop into ¼” pieces. Mix shrimp, corn and tomatoes together in a medium sized bowl. Follow 3-step cooking method mentioned above to cook bacon bowls. Serve garnished with minced cilantro and lemon wedges.